It’s that time of year that many business owners dislike…checking our cash flow, adjusting our overhead and changing our pricing as needed. A necessary evil if we want to keep those smiling faces you see every time you come to our bakery or farmers market stand. This year was especially painful when we found out several of our ingredients have increased dramatically. For example, our mangos have increased 40%. Of course, we can’t grow delicious Granny Smith apples on Kaua’i, and even those have knocked us for a loop this year, increasing anywhere from 21-40%! Our coconut has even increased over 10%. The lifeline to our pies, butter, has gone up nearly 10% this year alone. In addition, we have seen a steady increase of 5-8% on all our other dairy products repeatedly in the past 3 years. Even though we try to source as many ingredients locally as we can, we still need to import things like butter, flour, and sugar to make that delicious flaky butter crust. Unfortunately, the shippers must have their piece of the pie, so to say. Imagine this, we can purchase a pie pan on the mainland for $4, but it costs us $6 to ship it here. Crazy, isn’t it?!? In addition, we must bring in the plates, pie tins, forks, even our napkins. Of course, that is just a part of doing business on Kaua’i, you don’t really care about that…you just want to know what this means to your favorite slice of pie! We felt we had two options, first was to decrease the amount of the goods…the actual fruit, nuts and deliciousness in each pie and replace it with more filler…ie. Thickened fruit juices and syrups. Well, anyone who has had any pie conversations at all with Baker Sandy can imagine just how well that went over. Our second option was to increase our prices to offset some of the additional costs. That was the choice we made. Change is never easy, we will be the first to admit that…but Change is a necessary part of life. 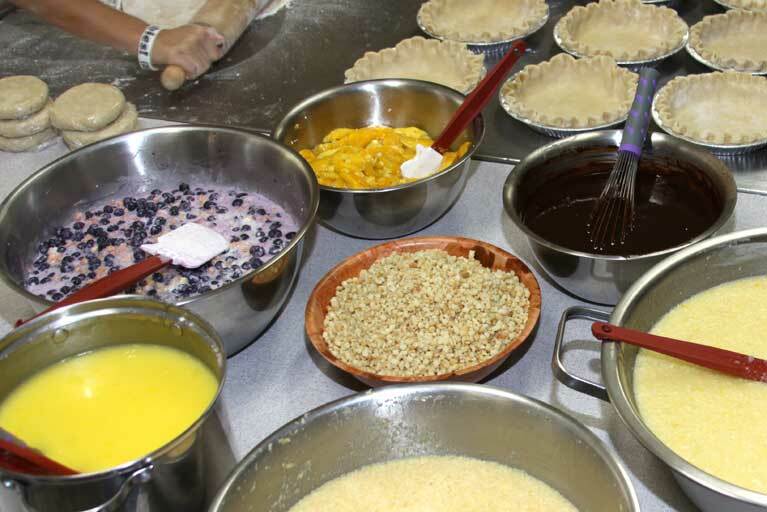 If making delicious pies was easy, everyone would be doing it! What this is going to mean over the course of the next few days is a small bump in our prices. For example, you will see your slice of pie going up from $5.70 to $6…or about a 5% increase. Not too bad, huh?!? We have also made the difficult decision to change the pricing structure of our whole pies. What this means is a fun new term…we are not sure just yet what it will be, but we were thinking premium…what do you think, does that sound fancy enough?!? Really what it means is that we will have 2 price points for both our baby and our deep dish size. Some pies have not increased much in cost, so we can leave them at the existing price points, a few have increased drastically, so we need to share that with you. Nice of us, huh?!? My momma taught me to share! Ok, so it wasn’t really that funny…but it is what it is. I am sure you see it everywhere, it just so happens that this year we wanted to make you aware, so we didn’t give you pie sticker shock next time you stop by. So, as always, we are extremely grateful for your support and hope to see you soon at the pie counter!